I have only just left hospital myself after my own surgery to hear the sad news that GURU KEITHY E (KEITH ELAM) from the legendary hip hop group GANG STARR passed away yesterday 19th April. According to the New Musical Express website he had been suffering with cancer for a year and also the after effects of his heart attack late in 2009. I personally am upset by the news, and it also puts into perspective my own medical problems of late. GURU and I are of similar age, so it seems I am getting off lightly. You don't need me to tell you what kind of effect GANG STARR as a crew had on hip hop music. Suffice to say their sound became a blueprint for success, and synonymous with that boom bap sound of the 90s. 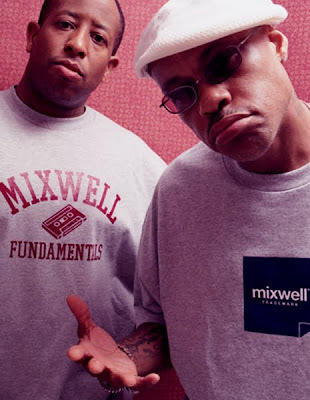 The GANG STARR concept actually began in the 80s with DJ MARK THE 45KING originally providing the beats and cuts for GURU, followed by DJ PREMIER a few years later who took control of the beats and turned GANG STARR into one the popular hip hop groups. I remember first hearing HARD TO EARN lp in 94 and despite loving NO MORE MR. NICE GUY, STEP IN THE ARENA, and DAILY OPERATION LPs, I couldn't believe it was still possible to take it up a notch on a fourth album. And they achieved this level of competence. No weak sauce. Ask any SERIOUS hip hopper and he will no doubt drop the GANG STARR name in his all time top 10. Trust me on that. I may not be a huge fan of GURU's solo work, and I am also disgusted at what I read of GURU's producer/business handler SOLAR (let's leave that subject alone) but more importantly I am saddened that we have lost half of the duo whose logo was the chain and the star. A logo which has been on my lab wall for over 15 years. I bought the poster from their 1994 London gig at THE FORUM in Kentish Town. What a night - real hip hop my man. GURU you will be sorely missed. Love goes out to your friends a family, and a huge thanks to you personally for your contribution to this music we love. It was by no means a small one. Painfully sad news of the passing of Guru Keithy E, today ive been haunted, though in a good way, by memories of his finest moments on wax. From the first tunes I ever heard by Gang Starr "Bust a move boy" and "Believe dat" onto "Movin On" "Knowledge" and "Words I manifest" back on capital rap show in the late 80s, and by the undeniable influence the voice and flow posed onto me when i bought the "No More Mr. Nice Guy" album on import in 89, in terms of developing my own rhymes from basic braggadocio to more conscious thought provoking subject matter. Doesn't stop there, the feelings i felt still resonate my brains when I heard Guru's rhymes move up another level on "Step In The Arena". Goose pimples with combined feeling of optimism the 1st time I heard "Who's Gonna Take The Wait" and "Just To Get A rep" on the capital rap show seem like yesterday. The criticism of Guru being carried through his career as an MC by Dj Premier i have read on blog sites in the last couple of years i feel is sadly unjust and highly untrue as I feel Guru was as unique to the art of rhyming as Premier is to the art of beat-making i think they made the perfect combination both sounding complex, original and unique respectively. Many of our favorite MC's have jumped on a Premo beat, but in my opinion none apart from Guru have complemented Premier's sound so naturally,it's almost uncanny and strange but true. Okay yes, Nas gelled a near perfect performance on "NY state of Mind" and id always give him credit for that, but nothing ever sounded so pleasing to the ear as Keithy E rockin' over a Dj Premier beat, it was the ultimate partnership in hip-hop. KD, not reached out for a minute bro i'll hit u up with an email shortly, wasn't aware of your surgery hope you make a full recovery, hold ya head...get well soon hops. He dropped countless jewels on every album...Some of his proverbs resonate in my head till this day......R.I.P. I actually heard the news on the way home from work in my local record shop. Gave up flicking through the racks and left. Real head f*ck. Extremely sad day for me. Hope you're feeling a bit better now Dom. Hit me up for a chat when you're up to it. Hip hop has been losing waaay too many pioneers for my liking, but this news is the worst yet. Gangstarr have been in my top 3 groups since hearing Deep Concentration & Manifest, (the other 2 groups being PE & Tribe). I was at that same Gangstarr show at the forum in 94 (as well as the 91 show there as well), and I'd definitely say they were one of the dopest live hip hop crews. There's a funny story of how my boy Pete blagged us into the show, but I'll save that for another time.